It’s hard to believe marathon week is here. When I started training it was cold, there was snow, and lots of ice. This past weekend I was thinking how hot and muggy it was outside. I’m happy I got a few runs in some heat so that I am prepared if race day ends up being hot and humid. Most of my runs as of late have been with higher than average winds and there have been a handful in the rain. It’s made it rater difficult to determine where I am at fitness wise. I know what marathon pace feels like more by effort than by pace right now. I have been keeping an eye on the forecast and it looks like it could be a potential warm and windy marathon but at this point that could change. If that’s the case, I may have to adjust my goals. In general, my training has gone really well. With the help of my Zero Runner for some added no impact miles, I have run 1,250 miles this year and didn’t miss a single strength session. I also invested in a recovery tool called the Air Relax recovery boots. Many people have seen the NormaTec recovery boots at race expos. The Air Relax is a version of that, but something I could afford. My legs have not felt this loosened up in ages, it uses air to give the legs a massage and flush the lactic acid. It was well worth the investment. In preparation for the race I have my usual routine. I stop strength training 3 weeks out. The two weeks before I work extra hard to eliminate the junk food in my diet (I have a sweet tooth so that’s hard to do.) I eliminate caffeine until race day because I like the extra kick I feel when I take it after being away from it. My go to meal 48 hours before the race is quinoa. The workouts this week are pretty light for me. 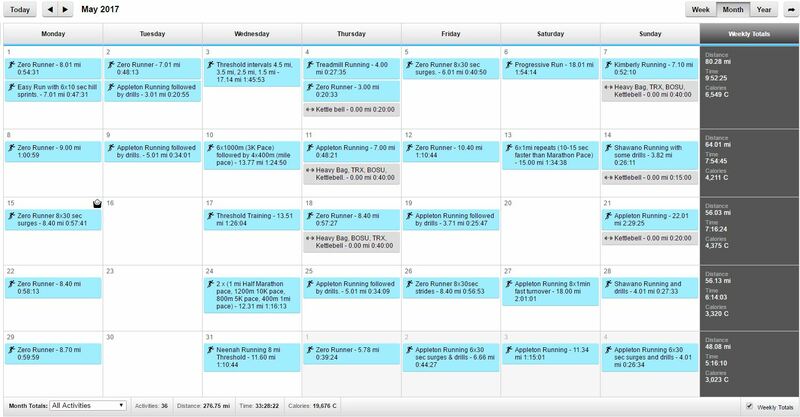 I have already done a 1 hour run on the Zero Runner on Monday, I did a 45 minute run this morning, tomorrow (Wednesday) I have some fast/short internals of 200s, 300s, and 400s to get the muscles moving quickly while still staying fresh for race day, 3 miles Thursday, a day off Friday, and basically a warm up followed by strides and drills on Saturday. Here is a link to my training in May for those curious how I train, I always like to learn from others. I hope everyone’s training went well and I look forward to seeing everyone on Sunday and good luck to all runners!! It really is a beautiful and fast course if you’ve never run the HFM Maritime Marathon before.